Since we’re staying here 2 nights, we took our time getting up. Had breakfast of croissants, rolls, juice, and coffee, then sat by the pool a while. Took a dip. 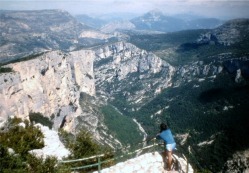 Around 11 we left for the “Grand Canyon de Verdon”. It was a little further than we expected. We stopped for lunch in Moustiers, where we ate in a little café filled with locals rather than tourists. All the tourist cafes required a 3 course meal, which we were not up for. (Ed. Note: Had we known, we should have tried to get into La Bastide De Moustiers, which was just then coming onto the restaurant scene as one of the top restaurants in the world. THAT we would have been up for.) I had a seafood tagliatelle (noodles and cream sauce) – excellent, and Jill had a country salad. Then we entered the Grand Canyon – it most reminds me of Yosemite, though less lush. Provence is very dry – it reminds us of California. Hot too – about 80-85. In case I forgot to write it down – the last week’s weather (since the Loire) has been just about perfect with sun and clouds, 70-80 degrees. Anyway, back to the Grand Canyon. Lots of views – some over 1000 feet down. The canyon gets pretty narrow in spots and you can see the road on the other side. No guardrails, of course! Saw German rock climbers ascending El-Capitan-like rock faces in their bare feet. 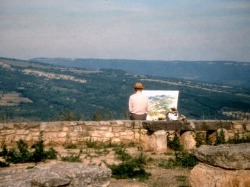 The light here is weird – people speak of a different quality of light in Provence. It is more like a glare, as the sun seems to be very low in the sky all day long. There’s a haze (smog?) that hangs in the air. Spent several hours at the Grand Canyon, and as a result it was a long 2-hour drive back. Plus, we wanted to try and find another restaurant for tonight’s dinner. It took us a while but we succeeded – there’s an interesting-looking Provencal specialty restaurant up in town – on a dirt road right around the corner from the boules court. We’ll keep our fingers crossed. Unfortunately, bad luck struck. We arrived at the restaurant but it was their night of “Fermeture” (closed). The other restaurant in town, Le Petit Jardin, was also closed. So, we ended up back at the hotel. This time we ordered A La Carte and dinner was better. I had a Salade “Perigourdine” that had some kind of cooked meat on top (probably better that I didn’t ask what) (Ed Note: gizzards), and Jill had tomatoes and mozzarella which was very good also, but had about 6 lbs. of tomatoes which she couldn’t finish. Then I had veal with mushrooms (good, except too much sauce) and Jill had pork medallions (very good). For dessert I had a raspberry glace and we both had Grand Marnier.